The fall & winter seasons open you up to potential for all sorts of physical injuries. No, we�re not talking about the strain from lifting a dozen pumpkin spiced lattes per week, although that may already be an epidemic. Instead, we�re referencing outdoor and yard work here folks. This season has homeowners out in the yard performing all sorts of season-specific duties, from raking leaves to harvesting the garden. You�re putting your knees, hips, back, shoulders, and neck (etc.) through a unique serious of motions that they may or may not be accustomed to. This, together with the colder climate will take a toll on your muscles, tendons, tissues, ligaments and bones. To make sure you make it through the season without injury, you need to be armed with the right information, advice that will help you prevent ailments common to autumn activities. Your body is coming off a summertime routine, and now you�re thrusting it into a different environment, one that is colder and conducive to injury. 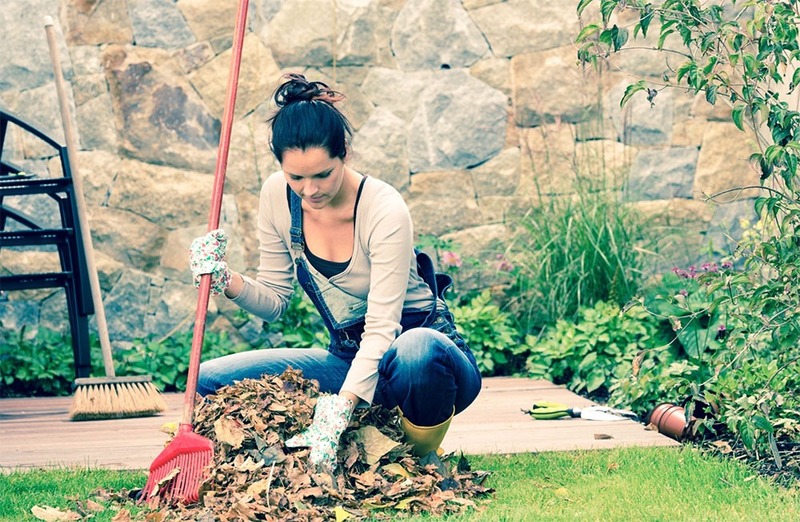 Therefore, you must treat yard work in the same manner that you would a visit to the gym. In other words, warm up.You may feel silly doing this (for yard work) at first, but remember that as we age, the connective tissues and muscles around our joints are less flexible and less pliable than they we were years ago. As a result, jumping from the stagnant position of your bed, sofa, or kitchen table and right into yard work can get you injured.Take 5-10 minutes to stretch and warm up to get the blood pumping to your muscles and soft tissues and warm up your whole musculoskeletal system. As your body begins to generate heat, your connective tissues will become more pliable and less open to injury. Stretching positions and warm up activities should mimic those about to taken in the yard or garden, including (but not exclusive to) squats, knee lifts (to the chest), overhead arm extensions, and side bends. Hold each position for 5-10 seconds and repeat three or four times on each side.Note: Remember to perform �cool down� stretches after you�ve completed your outdoor work as well. Wearing the wrong clothes can open you up to injury too, so skinny jeans in the backyard simply won�t do. Instead, opt for loose fitting clothing that will allow your body to bend, extend, pivot and move naturally. Also dress in layers, so that you begin your autumn garden and yard routine warm while allowing for the removal of layers when you begin to heat up, ensuring that you remain comfortable throughout.In addition, make sure that you wear appropriate footwear. Slip and falls are one of the primary causes of injury in the autumn in Canada. While working in the yard, you will be walking over slippery surfaces thanks to frosty conditions and moist leaves scattered about the property. Shoes should be tied firm, sturdy, and have non-slip soles. Honor your body by bending the knee, and not your back. Your leg muscles are much stronger than your lower back muscles and are meant to withstand frequent bending. Therefore, always remember to use your knees when lifting or bending over to pull weeds and/or work in the garden. In addition, step in the direction you are raking, instead of twisting through your waist which will strain your lower back. When down in the garden, place one hand on your thigh or the ground for support while the other arm works. Most people favor one side of the body when pulling weeds, picking potatoes, cutting down perennial beds, or whatever else has your arms in motion in the yard. However, repetitive work on one side will cause an imbalance and inevitable strain, potentially impacting hands, forearms, biceps, triceps and shoulders. Instead, put your arms on a literal schedule, switching from right to left and left to right through each unique activity. If pulling weeds for 10-minutes, allow 5 minutes for each side. If picking potatoes for 20-minutes, allow 10-minutes for each side, and so forth. You get the idea. You�re familiar with tennis elbow and golfer�s elbow, but what about pruner�s elbow? Many people get elbow, wrist and hand strain in the yard because they are working in �parts�. Operating pruners should not be done through effort below the elbow alone. Instead, cultivate a more body-regional approach to pruning, and all other yard work for that matter.Start by focusing on your arm as being an unbroken line between the forearm and the hand. If you bend your wrist forward or back, or tilt it to one side when pruning, you may strain the muscles that are keeping them in each respective position. By keeping an unbroken line along your forearm and hand, you adequately distribute effort along the line and avoid straining one particular zone. Also note that this unbroken line extends even further. Your arm is connected to your shoulder. By becoming more aware of the connection from your hands all the way up to your shoulders, you can develop a more body-regional approach to pruning (etc.). By bringing your shoulders into the effort, you will properly redistribute the weight across your arms, forearms, wrists and fingers, keeping pruner�s elbow (and other potential ailments) at bay. Have you suffered an injury while working in the yard this season? Or are you seeking to treat existing pain and/or a loss of function so that you can return to the garden this autumn? Contact Contact Collegiate Sports Medicine today and we�ll get you back in the backyard, before it gets away from you.